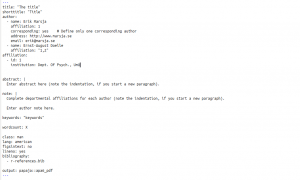 Papaja provides an RMarkdown template that is used with R to create manuscripts (PDFs or Word Documents). However, listed as an experimental feature, output your manuscript as Word Document, does not work properly. I have successfully created some PDFs seem to conform to the APA 6th Edition guidelines. Papaja uses the LaTeX document class apa6 and a .docx-reference file to create documents. 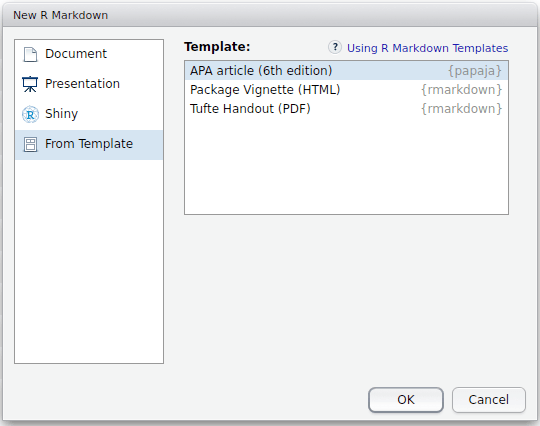 After choosing the APA article template you an RMarkdown template will be created (.Rmd). 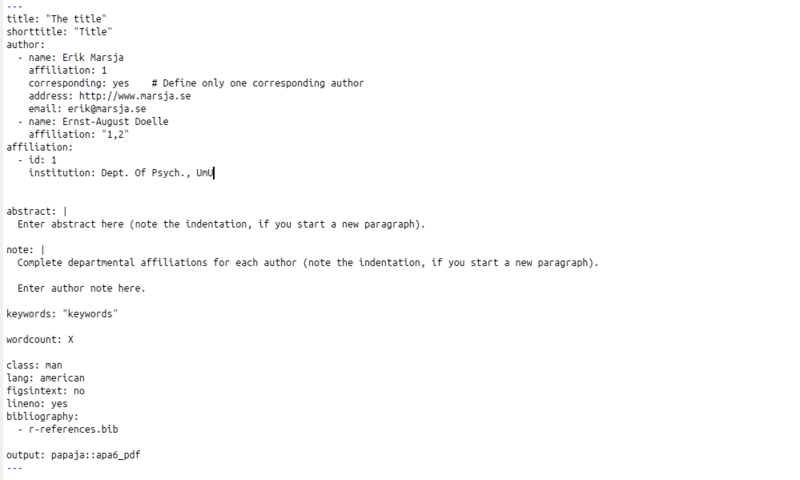 In the templates header, you insert the manuscript title, the author name(s) and affiliation(s). It is very easy to understand where and what you should put your information. If you are using a reference manager (e.g., Zotero or Mendeley) you can use it to export the citations you used, or will use, in your manuscript to a .bib-file. The .bib-file should be placed in the manuscript folder (i.e., where the .Rmd is saved) to make it possible to load it within Papaja (see the line under the heading “Bibliography” in the YAML-header). To add citations to your manuscript you use the reference citation key. For instance, if you want to have in-text citation you write @NameYear (e.g., @Marsja2015). Note, in-text citations for references with many authors will appear in the text with the ampersand symbol (“&”) and not the word “and” (see this issue for more information). For citations in parentheses you write [@NameYear]. Adding citations this way, and including your .bib-file in the YAML-header, will create a reference list after the text body of your manuscript. It will be hard to cite something and not include it in the reference list. Since Papaja uses Citation Style Language (csl) you can get your reference to conform to almost every style out there. As long that there is a .csl file. You can find styles at citationstyles.org, but you can also create one yourself. Papaja also provides some r-functions that created to make, for instance, the reporting some common statistical tests easier. There are functions for creating bar plots, creating tables, reporting ANOVAs, etc. I have only used the apa_table function so far. RMarkdown also makes it possible to run the R-code at the same time as the manuscript is created. This further makes it possible to extract the results and output them in the text. Example: Performance in the visual task was overall good (*M* = r exp1$M_Accuracy, *SD*, = r exp1$SD_Accuracy). In the above example, the data from experiment 1 is summarized using the package dplyr. The indicates that it is a R-code segment and so does the in the example after the above code snippet is also so that R will be run to output the accuracy (‘*’ surrounding the ‘M’ will output it italicized). As one can read on Papajas GitHub page that is under development. Therefore, this post might get updated when the package is improved. Papaja is really a promising r-package for researchers publishing in journals that follow APA guidelines. However, what you really want to know might be: does Papaja it easier to create APA manuscripts? Yes and no. One the one hand, If you have some experience of R, RMarkdown, and Rstudio you will quickly learn how to use it; the answer is clearly yes. On the other hand, if you don’t have that experience and knowledge it might take more time learn Papaja. However, I would still suggest that you do. Leave writing in Word, doing statistics using SPSS, and start using R, Rmarkdown, and Papaja. Despite this, I suggest that you leave the secure environment of graphical user interfaces (eg, Microsoft Word and SPSS) and learn R Rmarkdown and Papaja. Once you have done this you will create beautiful APA manuscripts in no time!